Stourbridge's home FA Cup fourth qualifying round tie against neighbours Kidderminster Harriers clash is more than just a local derby. As one of the few counties in England without a Football League club, it ensures 'Worcestershire' is guaranteed representation in Monday evening's draw for the first round proper. Gary Hackett's Glassboys are currently ranked two rungs below the visitors. But Harriers are bottom of the National League, and winless in 18 games. Worcester City, last season's first round heroes when they put out 1987 winners Coventry City, face a long away trip to Gateshead. Dave Hockaday, Kidderminster's newly-appointed head coach, is taking the in-form Northern Premier League side so seriously that they have bolstered themselves with another new signing. Teenage defender Kyle Howkins has arrived on a one-month youth loan from Premier League side West Bromwich Albion. 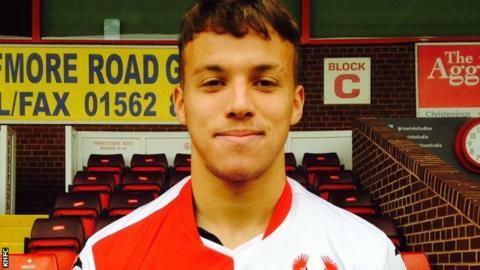 Having become the seventh new recruit made since Gary Whild and Tim Flowers left following the 2-0 defeat by Lincoln City five weeks ago, 19-year-old Howkins goes straight into the Harriers squad. The 6ft 5ins stopper, who was registered in time to meet with the Friday deadline, has been given permission to play at Amblecote. Stourbridge, who are third in their league, had gone unbeaten in 10 games until losing at home to Ilkeston on Monday night. Is Stourbridge actually in Worcestershire? Stourbridge was part of the old Worcestershire until being swallowed up in 1974 by the newly-created county of West Midlands in the regional boundary changes which followed the Local Government Act of 1974. But natives of the town still regard themselves as being from Worcestershire. "Around this area Kidderminster are the top dogs. For us to get the chance to pit our wits against them is fantastic. "It's well chronicled the problems they've had. But, if you check their results, they haven't been getting beaten badly and there quite a few draws in there. They may not be as poor as their results suggests. "We've still got to turn up and play to our maximum to beat them. Are we capable? We certainly are. The intrigue and the local attraction is massive. It will be a great occasion and we're hoping for a cup shock." Hackett was talking to BBC WM's Steve Herman. "Who's the banana skin? We've got to be honest, we haven't won a game. They're the form team. They're third in the league, we're bottom of ours. And I can see why they're where they are. "They're more experienced than us. But we're from two leagues up. We need to go there and show that pedigree. We will win a game and the sooner the better. It could be a launchpad for the rest of the season. "But talk is cheap and it will be about attitude. We have to make sure we are not outrun. They'll fly at us but we'll fly at them. We have to get at them as we're not good enough to sit back and defend." Hockaday was talking to BBC Hereford & Worcester's Trevor Owens. The War Memorial Athletic Ground, at Amblecote, is also home to Stourbridge Cricket Club and was once one of Worcestershire County Cricket Club's regularly out grounds. It has staged 61 County Championship games, the most recent in 1981. In recent seasons, Amblecote has hosted Football League sides in FA Cup ties three times. Gary Hackett's men were beaten 1-0 by Walsall in November 2009. But, two seasons later, the Glassboys got to the second round. They beat Plymouth Argyle 2-0 in a replay, having drawn 3-3 in the original tie at Home Park, before bowing out 3-0 at home to Stevenage.